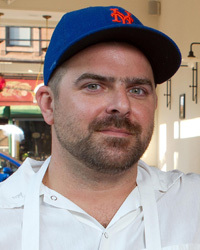 Why He's Amazing: Because he's helping to make Jersey City a true restaurant destination with his innovative, farm-driven cooking. On Moving to Jersey City: "I kind of wanted to get out of the city for a while. I came to Jersey City [in 2010]. My wife and I both really fell in love with the look of it all. It's in the early stage of a burgeoning new culinary scene. New York seems very saturated to me." Where Thirty Acres Got Its Name: From Boyle's Thirty Acres, an arena built in Jersey City in 1921 to host a boxing match that New York City had rejected. "The story behind the fight and its moving from New York City to Jersey City struck a chord with us. It just so happens to also sounded like a pretty good name for a restaurant—it suggests a certain freshness, I think."